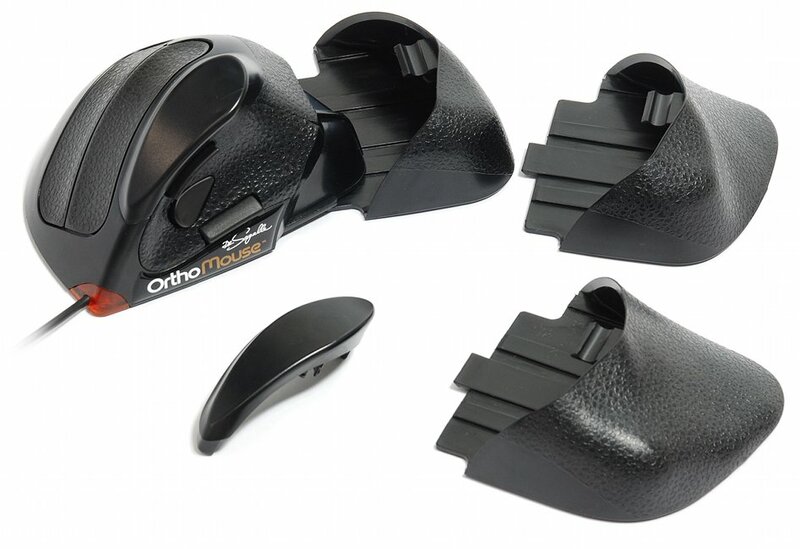 Today I’m looking at the OrthoMouse, an ergonomic and adjustable mouse that’s designed to keep your hand in a natural, comfortable position. Let’s take a look! 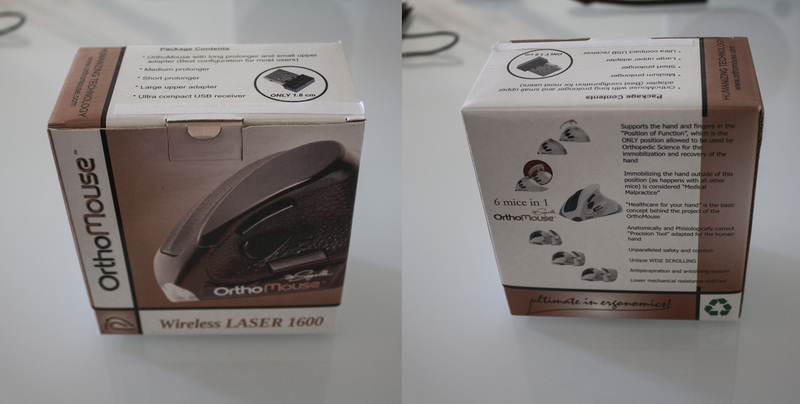 We’re looking today at the OrthoMouse Laser, although the wired optical variant is very similar in almost all respects. These differences are noted when applicable. The OrthoMouse comes in a simple cardboard box. 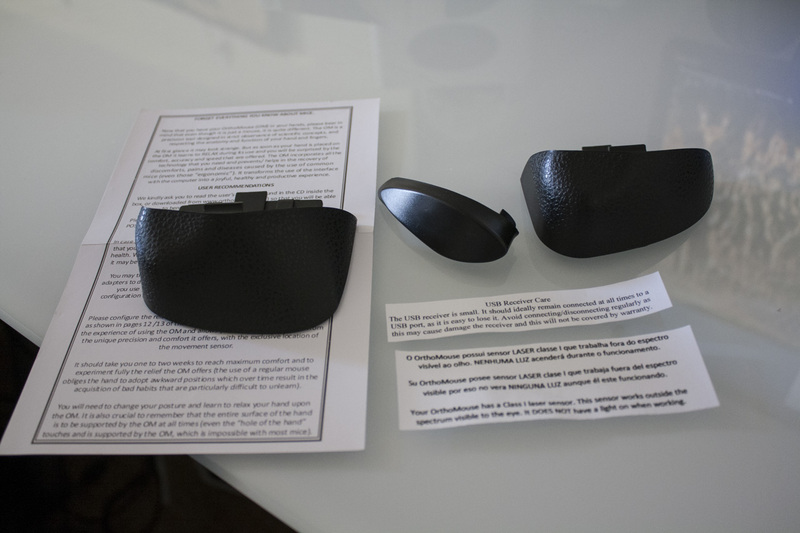 …and a number of upper and rear sections that allow you to customise the shape to suit your hand and grip style. The upper sections are called “upper adapters” and the rear sections are called “prolongers”. The smaller upper adapter is pre-installed, with a larger one in the box. In terms of prolongers, the long version is installed and short and medium options are in the box. You’ll also find a wireless adapter for the wireless model (as shown here). 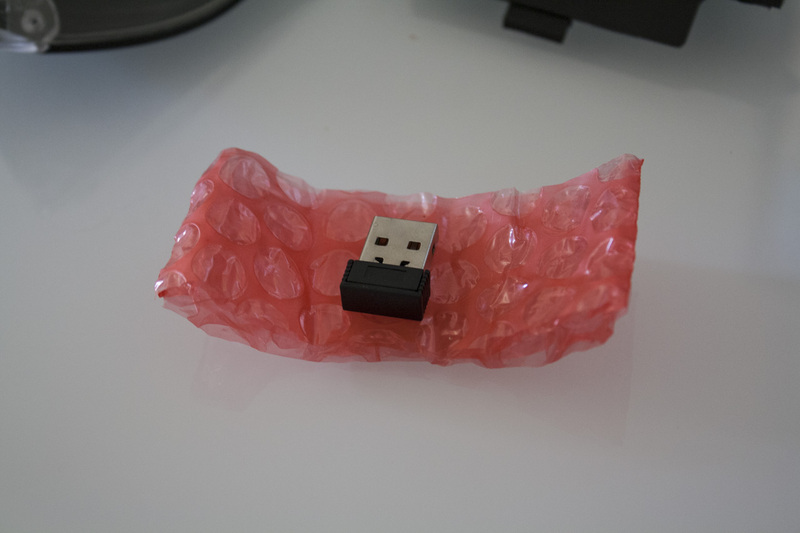 This is very short, so you can easily tuck it into the side of a laptop without it sticking out too much. 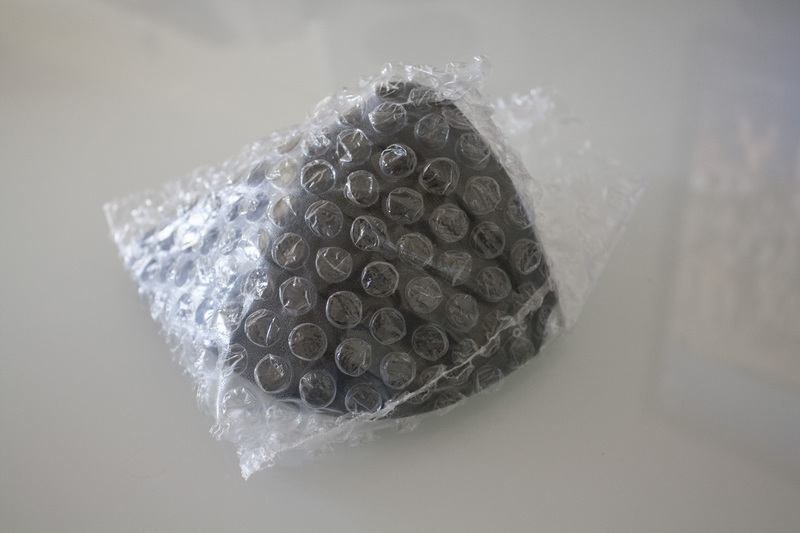 The wireless adapter is actually inside the mouse when first unboxed, wrapped in bubble wrap inside the battery chamber. 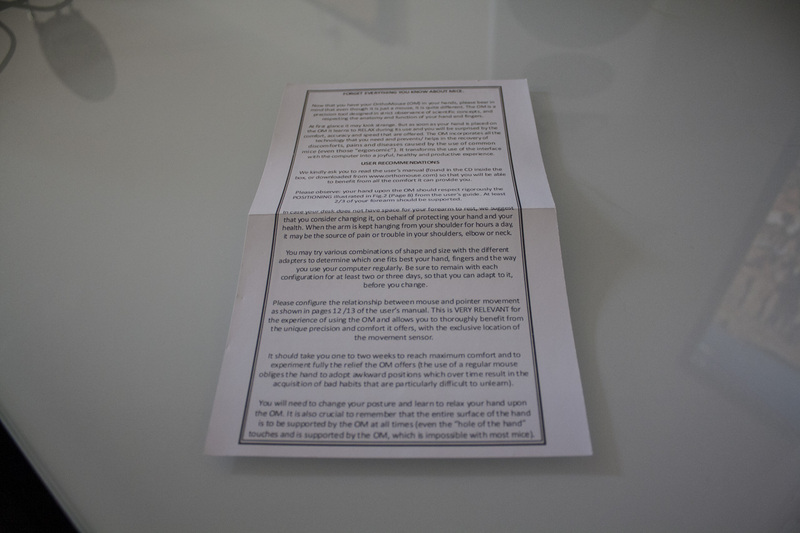 You’ll also note some small pieces of paper with various instructions are recommendations on them – including a note that the laser uses a wavelength outside visible light, so it’s normal not to be able to see the laser when it’s on. The OrthoMouse also has a nice document that outlines the idea behind the mouse, and provides suggestions on the correct posture, emphasising proper support for your arm. The manual (PDF) is also quite good for instruction on this point. 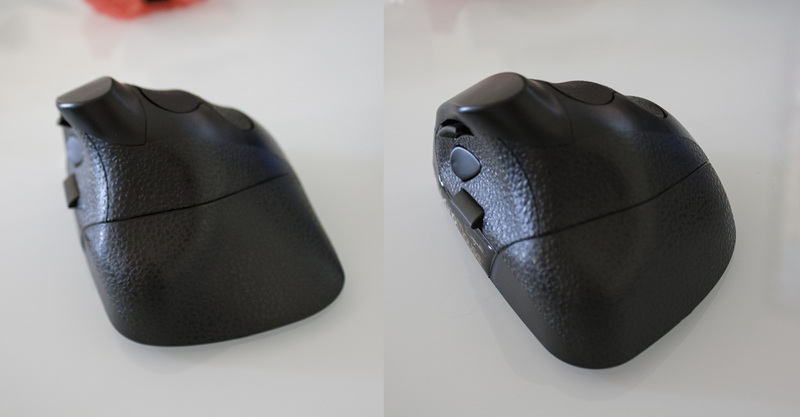 The OrthoMouse has an interesting design which is immediately different from most mice. 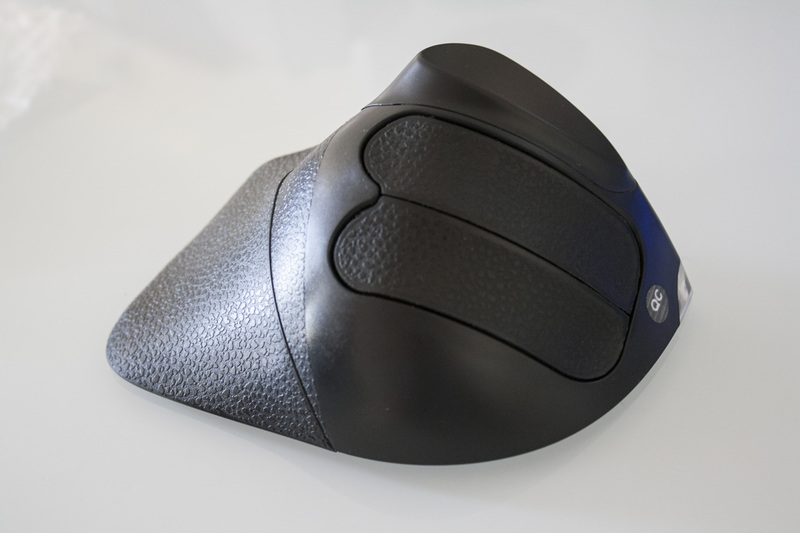 It’s contoured to fit your hand, with long left and right mouse buttons that sit directly underneath your first two fingers. The remaining buttons are on the left side. There’s one in the middle which acts as a middle click button, and buttons at the top and bottom which serve as a scroll wheel. Your thumb has to move only minimally to activate these controls. The upper section is replaceable as we discussed earlier, and sits higher or near equal to the side buttons. The back of the model can also be replaced with differently sized alternatives; the default is quite long, with two progressively shorter options. The default should suit most users and prove the most ergonomic, but it’s nice to have these options. 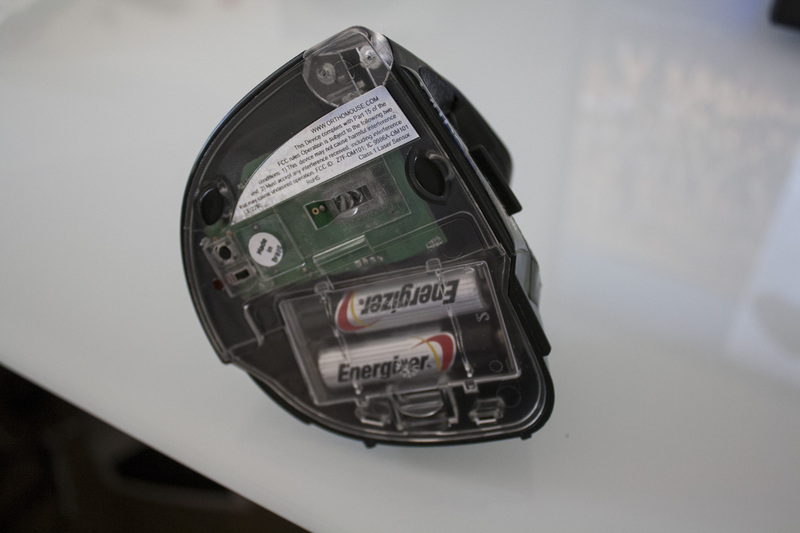 The wireless model requires two AA batteries (which are not included in the box), which are stored in a compartment underneath the prolonger. The wired model is identical, even including a (nonfunctional) AA compartment, allowing to be as balanced as the wireless model. The wired version, of course has a USB cable that attaches to the very front of the mouse. All in all, it’s a radical but sensible design. It won’t look out of place upon most desks thanks to its dark and textured matte finish, but should be noticed if anyone tries to use your PC. 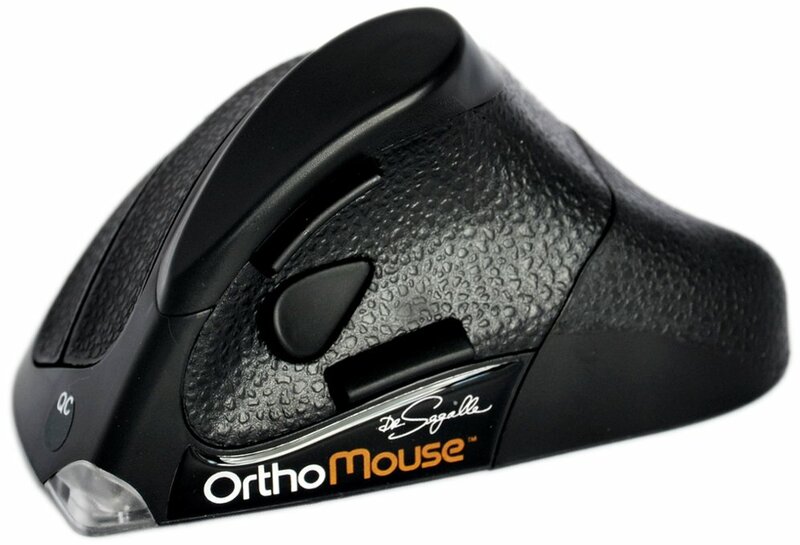 In order to evaluate the OrthoMouse, I used it over a period of two weeks as my go-to mouse. I also used it intensively for a weekend, playing a few games and getting some Word and Photoshop work done too. Of course, there was also a lot of Twitter and Reddit surfing going on too. 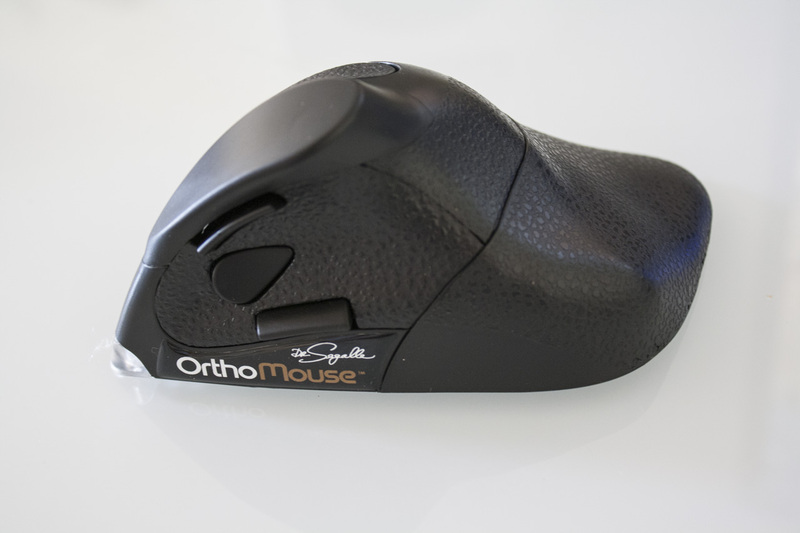 The OrthoMouse is immediately different in terms of design, but that doesn’t translate into a long training period – you can become quite accurate and comfortable within the first few minutes of using the mouse. My worry was that the mouse would have odd buttons or just feel weird, but everything was surprisingly natural. 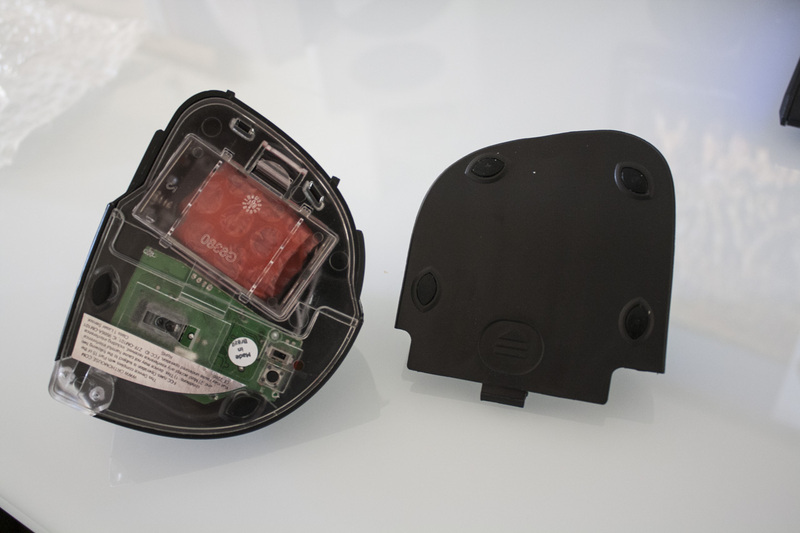 The buttons were easy to click, the sensor felt accurate, and of course the posture that the OrthoMouse inspires is quite comfortable. It was a bit odd getting used to scrolling using two buttons instead of a wheel, but I can see the ergonomic benefits here. After a few articles, I was scrolling around like a pro. I really noticed the difference after a long day working with the Orthomouse. Normally I have some aches and pains in my wrists and fingers, but I felt quite fresh with the Orthomouse. Adopting the correct posture seemed to work well for me, and working slightly more slower seemed to improve matters too. Overall, it was a highly comfortable mouse, and on a different level to the gaming mice I normally use. 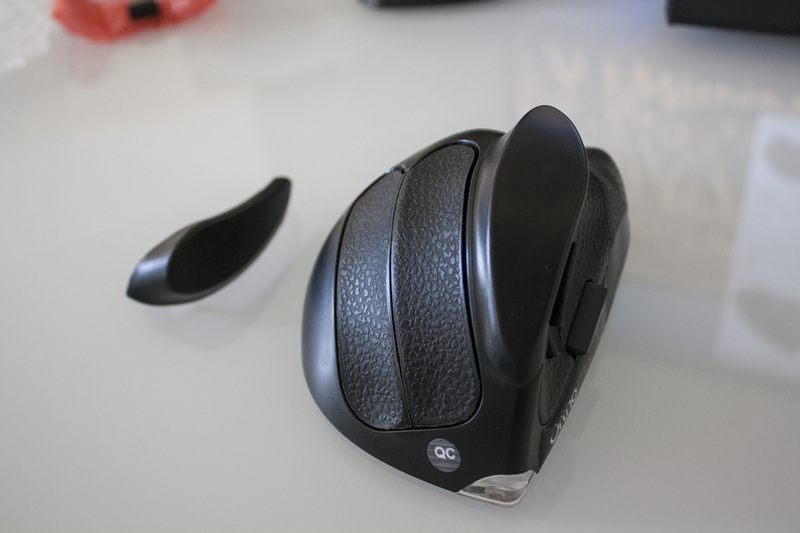 I’m a big fan of videogames, so I wanted to find out – is it possible to use this mouse for gaming too? Surprisingly, the answer is yes. I had no issues playing strategy and RPG games with the mouse, as it allowed for a comfortable position and reasonable accuracy, thanks to the 1600 DPI laser sensor. I even tried the mouse in Counter-Strike: Global Offensive, and it worked surprisingly well; I was able to place top three in a full deathmatch server. You’d probably still want a gaming mouse for competitive play, but for casual stuff the OrthoMouse works just fine – particularly if you go for a shorter prolonger. All in all, the OrthoMouse surpassed my expectations, proving a comfortable mouse for gaming, work and web surfing over even long periods. There are two different varieties of the OrthoMouse available. One is a wireless laser mouse, and the other is a wired optical variant. The two are quite similar in price, so it’s largely down to your preference – would you prefer a wireless option that’s more convenient but requires batteries, or a wired version that goes without? What do you think of the OrthoMouse? Let us know in the comments below, and feel free to use the links above to order an OrthoMouse of your very own!